Palazzo Ravizza is located at Pian dei Mantellini, within the historical centre of Siena, very close to all the main tourist attractions, such as the Cathedral and the Baptistry of San Giovanni, Piazza del Campo and the Torre del Mangia, Fontebranda, and the Medicea Fortress, are all within walking distance from our hotel. Along the ring road that connects Siena to Florence and Rome, exit at “Siena Ovest”. From the exit Siena Ovest follow the direction of Porta San Marco – Duomo. 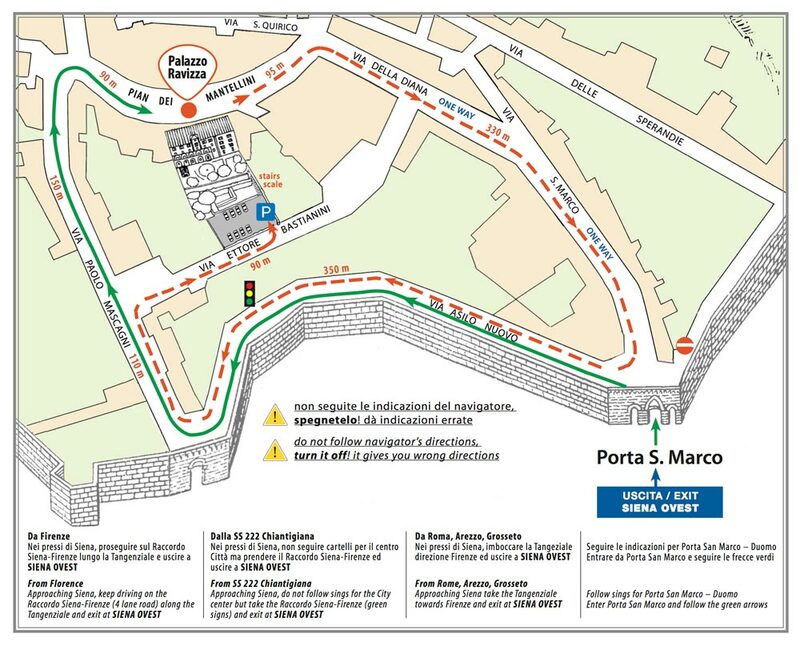 Entered to Porta S. Marco along a short stretch of road, along the walls, you will arrive to our private parking, located to the right of the road.